Bradford-born Cliffe taught John Ireland and Arthur Benjamin at the Royal College of Music where he was Professor of Piano from 1884 to 1931. His career as a composer appears to have guttered out by 1905 in favour of Academe. 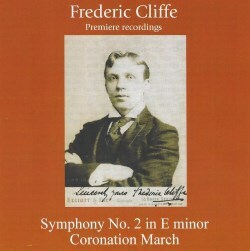 The British composer Frederic Cliffe has been something of an avocation for the conductor and writer Christopher Fifield. Back in 2003 he presided over Cliffe's first compact disc principally comprising the First Symphony (review review). That music was fittingly issued on Sterling as part of its 'British Romantics' series - the only entry to date in that line. This was followed up in 2011 by Cliffe's Violin Concerto on Hyperion although there the conductor was David Lloyd-Jones. Mr Fifield is accustomed to the romantic and discursive nature of Romantic era music and that familiarity meets its soul-mate in this Cliffe symphony. He has written authoritative and engaging books on Max Bruch and most recently on The German Symphony between Beethoven and Brahms (Ashgate, 2015) - a much needed study. This conductor's related journeys of discovery and revelation on Sterling have extended to Robert Hermann, Richard Franck (review review), Philipp and Xaver Scharwenka and Andreas Hallén. Now with the Lambeth Orchestra we get to hear Cliffe's Second Symphony written four years after the First as a Leeds Festival commission. The present performance and resulting disc were Mr Fifield's 70th birthday present to himself but also to us. As he says "It's with my Lambeth Orchestra and considering it was all done in a day, I am proud of the result. … In many ways it's a better work (than the First Symphony)". It's a long symphony in four movements with pictorial titles: I. At sunset [15:57]; II. Night [19:16]; III. Fairy revels [9:59] and IV. Morning [14:47]. Its power is in mood illustration rather than in symphonic steel. The character of the writing is loquacious, poetic and instinctive. You must not expect the grit and drive of the Elgar First Symphony. This is broadly speaking more in the track of the Raff symphonies and some of the more laid-back Huber examples. The second movement broods and muses - almost indulgently Delian as does the first movement where the nature painting seems to predict Bax's Spring Fire and Bantock's very much later Pagan Symphony. The Fairy revels movement is bright-eyed and bushy-tailed with writing that reminded me of Glazunov's The Seasons and Tchaikovsky's First Symphony. There's sprawling grandeur of a Stanford-like character in the sturdily triumphant finale. With horns enjoyably to the fore (try 9:35; 13:38) the music reminded me of the much later orchestral signature of Stanford's Piano Concerto No. 2. Cliffe 2 is an heroically ambitious project and the Lambeth Orchestra do very occasionally sound hesitant or queasy as in the complex liquid wash of lyrical lines at the start. Even so their playing convinces the listener of the calibre of this huge score which is put across under Fifield's informed and inspired grip. Not content to leave it at that the disc also includes the 1910 Coronation March which goes through most of the right motions and is enjoyable. The Trio is nicely noble although the whole lacks full-voltage Elgarian snap and crackle. It is fascinating to hear as an example of a luxury deep-pile march written for the following year's ceremony for George V. There's applause at the end too as, unlike the Symphony, this was taken from a concert. Helpful notes complete a fascinating disc that stylishly and enjoyably advances the cause of British music and of research and appraisal of the genre.